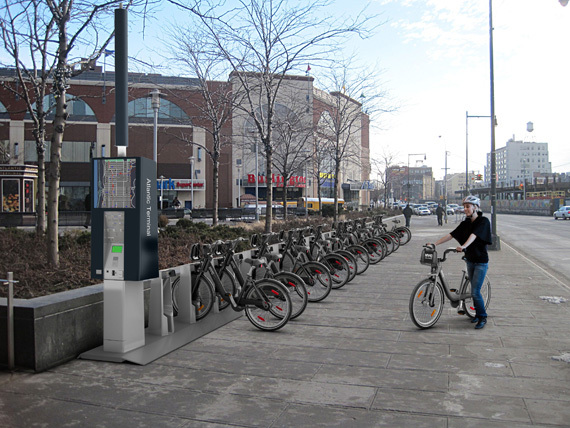 A rendering of a proposed bike share station in front of the Atlantic Terminal in Brooklyn. Whenever I leave my apartment for a stroll around my neighborhood, I walk past a former bus route. The B71 used to run, now and then when it felt like it, up and down Union St., and the CEMUSA shelter sits unused around the corner. Now, though, the city could find a use for these useless structures. The bus shelters that are remaining on now-defunct bus lines are pretty much the pinnacle in useless infrastructure. Unless one believes the MTA is going to one day restore those bus lines — an unlikely proposition that would still be years off — the shelters serve only to satisfy an advertising agreement the city has signed with CEMUSA. They take up valuable sidewalk space, burn bright in the night sky and exist only to serve ads in high-traffic neighborhoods. What’s the point? The bike share, in other words, will complement the subways and buses, but how? To include the public as much as possible in the planning process, DOT has opened up a website asking for the public to request bike-share locations, and nearly every corner in Brooklyn and Manhattan seems to be claimed already. People clearly want access to bikes. A clear answer came to me immediately, and I posted it to Twitter yesterday morning: “The obvious solution for bike share stations would be to use abandoned bus shelters along axed routes.” These shelters exist already, and many of them are along well-established routes. The city doesn’t have to use every bus shelter, but those, for instance, along Union St. would be ideal for cross-Brooklyn bicyclists. Reactivating wilting infrastructures whose only current purpose is to serve ads could do wonders for the streetscape. Those responding to my plan questioned the location. It’s better to have bike share kiosks near major retail locations, of course, but the point of the bike share is to reach all neighborhoods. With 600 stations — that’s over 130 more than the number of subway stations in the city — DOT can blanket residential neighborhoods as well as key retail hubs, and the shelters, especially those at key intersections, provide them with a clear location. As proponents have noted, the city will have to tred carefully over the next few months. The media is always skeptical of bike initiatives, and even though this bike share program will be paid for via private contributions and user fees, it’s going to arouse those who want to keep fighting the battle for city space between cars and everyone else. Once the fervor dies down, though, and the city begins to whittle down the list of bike share locations, they can look to former bus routes for guidance. The bikes can’t fill the holes left by the service cuts, but it’s a start. NYC drivers are some of the best, and yet most aggressive drivers I’ve seen. It’s very clear some drivers have a hatred for bicyclists and sometimes they have good reason. As a frequent cyclist throughout the City, I’ve witnessed some really angry drivers (the type you would expect) who resent giving up any space for a biker and yet will wait for a double-parked car. And then you have pedestrians, InPalm, walking and texting oblivious to the world. They seem to view cyclists just as pedestrians, not gauging the velocity of 200 pounds coming at them at 15mph. A Bike Sharing program could be real interesting. You say all that about NYC drivers and then say they’re some of the best? NYC drivers are only “some of the best” from the perspective of bonerstorming 19-year-old males who see them acting like raging maniacs without (usually) hurting anyone, and then attributing the fact they didn’t hurt anyone to their skill. Such drivers only get away with their outrageous behavior because the city and NYPD put very little focus on preventing it. Traffic violations are almost ignored and, even when when real casualties or fatalities happen, the punishments tend to be light. Seriously, let’s see drivers show the same callousness on the sidewalks they show in their SUVs. The homicide rate would go back up. I dont understand how you propose the shelters be useful. Theyre much too small. Agreed. The stations in DC are much larger than your average bus shelter. Not only that, but the stations themselves have their own siting requirements. They require a certain amount of space, as well as space to access the bikes. They also should be sited with room to expand if needed (the stations are modular and you can add docks to an existing station if demand warrants). They must be on a flat area (not necessarily level, but flat). They must occupy a significant area without obstructing manhole covers or utility grates. They must be in a position to receive a certain amount of direct sunlight every day to power the station (even in height-limited DC there are issues on downtown blocks with stations on the southern, shaded side of the street). Maybe these shelters would be a good starting point for station location decisions, but those other technical criteria will be the most important items. Shelters themselves are much too small and probably wouldn’t meet all of those technical requirements. Thinking many of the lines that were eliminated (like those near me in Queens) are in areas that won’t be considered for the bike sharing plan. For those shelters in Brooklyn and Manhattan that can accommodate the bikes (with some reworking of course), sounds like a pretty good idea. Would a bike-share shelter/kiosk really work where there are no dedicated bike lanes? Between our moronic local politicians and our litigious public, I see this as getting attacked from all angles and would be a non-starter. Don’t get me wrong, it’s a good idea, but this is the world we live in. It’s been a huge hit in DC and they have far less dedicated bike lanes (I think they only have one, actually) than NYC. I think bike shares through residential neighborhoods will be essential to its success, otherwise how would people get to the shopping areas with bike share stations? Or for that matter, how will people get home with all the amazing goods they purchase on their bike share bike? So it’s obvious that you can’t really have bike share just in commercial districts, if so all they are good for is getting from store to store, with no way for people to home or to there. But with all that said I don’t like the idea of converting bus shelters for bike share stations. For one I think the bikes are relatively ruggedized and unless every station were to be covered having a few covered in the system would probably have no real net effect on the bicycle condition. Further I don’t think anyone in Brooklyn isn’t hoping that bust lines like the B71 will be resurrected, if we put bikes inside shelters, where will people stand when the bus comes back? Sorry Ben, I think this is a very obviously terrible idea. Noah: I don’t believe your points adequately critique my plan though. It’s not about providing protection for the bikes; it’s about making a better use of sidewalk space that’s currently occupied by giant advertisements and impeding pedestrians. As to the B71 and similar bus routes, Brooklynites are going to be waiting out the 95 years left on the CEMUSA contract before those bus lines are restored. It’s a nice dream, but it ain’t gonna happen. I think the bus shelters stand as a reminder that there were bus lines along routes such as the B71, this constant reminder will keep the bus line cancellations in the public consciousness. I know people who live in Carroll Gardens that still talk about the canceling of the line and still are fighting for its restoration and I suspect many more people who aren’t as transit savvy see those stops every day and are reminded of the lines former existence. I don’t understand your reasoning that the route couldn’t be restored before the CEMUSA contract expires in 95 years, but perhaps there is something I’m unaware of. I also don’t see how putting bikes in the bus shelters would free up any space or remove any giant advertising, those shelters and their advertising will still be there and have the same foot print so it seems all the negatives of those shelters of which you speak will still exist even after the conversion for the remaining 95 years on the CEMUSA contract. On Contenental Ave. in Forest Hills there are 2 shelters set up just up just for bikes & most of the time they are full. So I see no problem with bike rental stations in these shelters. Now of course some locations will be better than others, but how will you learn unless we try it. One of the problems is there aren’t enough bike shelters. On Graham Ave for example, only about 15% of the bikes parked there fit under the shelter and that’s the only 1 around! So unless this is some pilot program to determine their usefulness, the program is woefully inadequate and needs expansion. Every station on the L from Bedford to Myrtle-Wyckoff could use a shelter or 5. Well, I guess technically the routes could be restored before CEMUSA’s contract ends in the early years of the 22nd century, but the MTA’s economic reality tells another story. They don’t have money to restore cut service, and they’re definitely not bringing back bus lines with low ridership that were very expensive per rider to run. Putting bikes in the shelters makes an active use of the space. Right now, these shelters are on the sidewalk with no purpose other than to serve as physically intrusive billboards for advertisements. There won’t be any bike sharing if Tom Coburn gets his way. Didn’t you know… spending money on bikes is a threat to public safety! You mean like sidewalks & crosswalks are a thret to public safety? Yes, they are a major threat to public safety because they don’t require gas to be used and therefore do not enrich oil companies. Bikes don’t enrich oil companies either. Hence, they are a major threat to corporate profits, I mean public safety. and somehow this is marketed to tourists? They seemed to be saying the big issues are as you all describe. Where to put them. Of course, the real underlying issue is safety. Will helmets be included? Who will insure the riders? This is covered by $100/year? Everyone said the same thing about DC: “Failed from the start.” And now they can’t expand it fast enough. And yes, it’s a huge hit for tourists. The announcement yesterday stated that there will be daily and monthly memberships available as well. So yes, it will be marketed to tourists. The 30-minute time limit is perfectly fine. That’s 2-3 miles. Say you need to get across town at 23rd Street. It’s a lot easier to ride a bike than wait for a bus that’ll crawl across town. All the naysayers will paint a tale of gloom and doom. Just like how the Times Square pedestrian plaza would never work. Just like how the separated bike lanes would never work. When are we going to stop listening to people who shoot down innovative ideas entirely rather than suggest improvements? In Montreal, where this particular technology originated, users are expected to bring their own helmets. I don’t know about insurance, but in the Quebec context there probably are not any as all residents have the same basic health-insurance policy and all cars carry “no-fault” policies. First off helmets aren’t legally required for riders under 14 in NYC, just recommended…. In melbourne Australia where helmets are required by law, 7 elevens and some local businesses have some deals, you can buy at 7 eleven a helmet for 5 dollars, this is of course a great deal for a helmet, but even more so in Australia where the cheapest helmets go for around $100, you can then even return the helmet and get $3 back. People in Melbourne have actually been fighting to make it so one would not need to wear a helmet at least on the bike share bikes. This has been big in some European countries for years. I hope it works in America as well. Bike sharing has so many benefits. People get exercise, less traffic on the roads, cleaner air or less commuting stress. The Subways are safe…but then what?